Pictured standing next to a 1923 Morris Cowley (Bullnose) are volunteers involved in the maintenance of 5 vehicles on loan to the NBC from Carlsberg Tetley. The picture shows Mark Chennell, Facilities Manager of Carlsberg Tetley present a cheque for £2000 for the maintenance of the five on loan vehicles for the next 5 years. 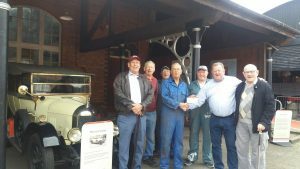 Pictured L to R are volunteers Vernon Docksey, John Marriott, Bryan Alston, Phil Irwin (receiving the cheque), Charlie Hayes, Mark Chennell, and James Toon.